The HEA-21538 water resistant gazebo heater uses radiant infrared energy that requires no gas or other flammable fuels, is clean, odourless and safe for the entire family. Infrared heat is safe for the environment with zero carbon monoxide emissions and hardly affected by wind, making this unit cost effective and environmentally friendly. Red hot infrared bulb lasts approx. 5,000 hours. The Dyna-Glo 1500W Infrared Quartz Heater is the perfect indoor heat solution for delivering room-wide warmth to your home. This energy-efficient unit features three heat settings (500W,1000W,1500W) while remaining cool to the touch, heating areas up to 225 sq. ft. It offers 5,120 BTUs of quiet radiant heat and comes fully equipped with an adjustable thermostat, integrated carrying handle, and steel cabinet. To ensure safety this heater was designed with a tip over safety switch, overheat protection, and a protective safety grill. The Hea-215J67 Bar height table heater with multi-coloured LED disco lighting features a square glass glass top which provides 360 degrees of radiant heat. High efficiently carbon fibre heating elements and a heating area covered with a cool touch technology material makes it safe to the touch. Setting the standard in efficiency and design the Frigidaire<sup></sup> infrared heater is a welcome addition to any living space. Its wood grain cabinetry and adjustable flame effect will add a touch of realism and elegance to any room. Newly engineered heat distribution chamber is combined with a full range of features and controls allowing you to quickly fill your room with evenly distributed heat, maintaining a comfort level that best suits your individual needs. The remote control allows you to choose heat settings, adjust room temperature via built in thermostat, set electronic timer and select temperature display. Safe for children or pets, as elements are not exposed. Light weight and easy to move, it rests on 4 swivel casters. The Frigidaire<sup></sup> infrared heater will provide you with years of comfort and efficiently controlled heat as it adds a charming ambiance to your living space. The MHU50NG Big Maxx is a natural gas fired, forced air convection heater. This unit is ideal when ceiling heights do not allow for infrared heaters to be used. It easily installs from the ceiling with included angle brackets. Unit has power exhaust which allows for both vertical or horizontal venting. Unit is thermostatically controlled and includes a spark ignition system with self diagnostic control module. Hanging Infrared Gazebo Heater in Red The HEA-21538 water resistant gazebo heater uses radiant infrared energy that requires no gas or other flammable fuels, is clean, odourless and safe for the entire family. Infrared heat is safe for the environment with zero carbon monoxide emissions and hardly affected by wind, making this unit cost effective and environmentally friendly. 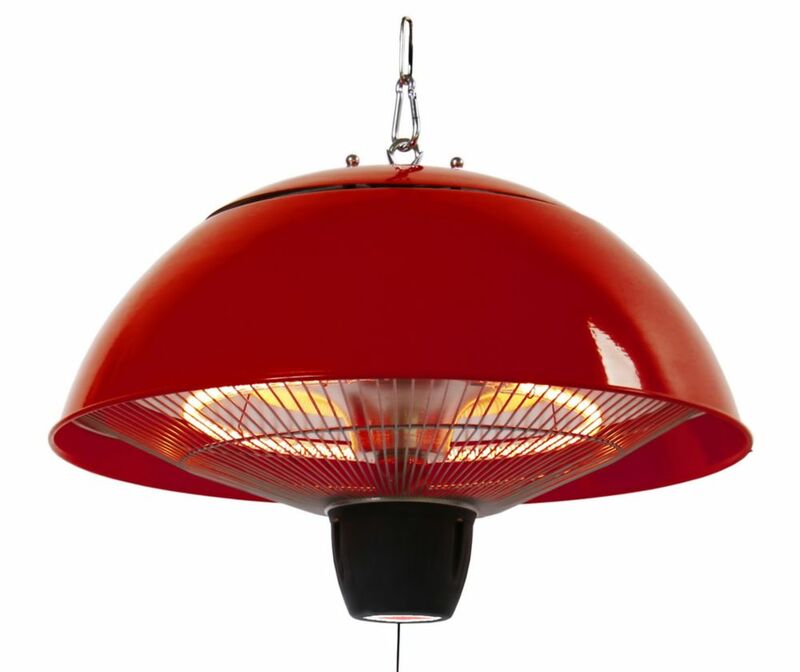 Hanging Infrared Gazebo Heater in Red is rated 5.0 out of 5 by 1. Rated 5 out of 5 by Anne197 from Awesome product and looks great. We bought this to use in the living room of our cottage, to take the morning chill off while having our coffee. So much easier than starting a fire in the wood stove and it gives instant heat. Looks great too!! The unit is +/- 16&quot; in diameter. Can someone provide information regarding the heat cast/vertical foot? For example, what is the heat spread should the heater be mounted 6' above the floor? The hanging models will cast heat right down to the floor. Because these heat objects, and not the air, a table would block heat from going underneath it. As a basic measurement with ambient temperature of 23 celsius (73.5 Farenheit) we got the following: 5 feet below the unit: 28 C (82.4 F) 5 feet below and 6 feet to the side: 24 C (75 F) 2 feet below and 3 feet to the side: 26 C (79 F) 5 feet below and 2 feet to the side: 26 C (79 F) This shows that there is a gain 3 to 5 degrees within a few feet of a hanging heater with most of the heat pushing straight downwards. Within 1 foot of the heater the temperatures were 45 C (113 F) Standing and wall mount heaters will heat further, but on a narrower angle. The hanging models are made to cover 360 degrees around so their heat is more spread over a wide area. Remember, these are heating objects, including you and your clothing, so over a span of time you will feel more and more warmth than in the instant that you turn them on.